When you step into the Monteverde Cloud Forest Reserve, you step into a world straight out of fairy tales. Here, clouds cling to every surface, shrouding the green forest in white mist. Emerald-hued epiphytes climb the trees, snaking their way heavenward, and blanket the forest floor. The vibrant jewel-tones of Monteverde’s beautiful flora pop, among them 500 orchid species. Don’t be surprised if you imagine a fairy perched on a flower’s delicate stamen. Trail hiking is the favorite pastime within the park. A hummingbird garden, just outside the gift shop at the park’s entrance, is guaranteed to delight adults and kids alike. Adventure activities in the area surrounding Monteverde are incredibly popular, with the full suite of canopy ziplines, aerial trams, hanging bridges and horseback riding. Cultural activities like coffee and sugar cane tours shed light on Costa Rican daily life. To sample a local treat, the Monteverde Cheese Factory is a must. Nature sites, such as the local frog pond and insectarium, are great for young kids. 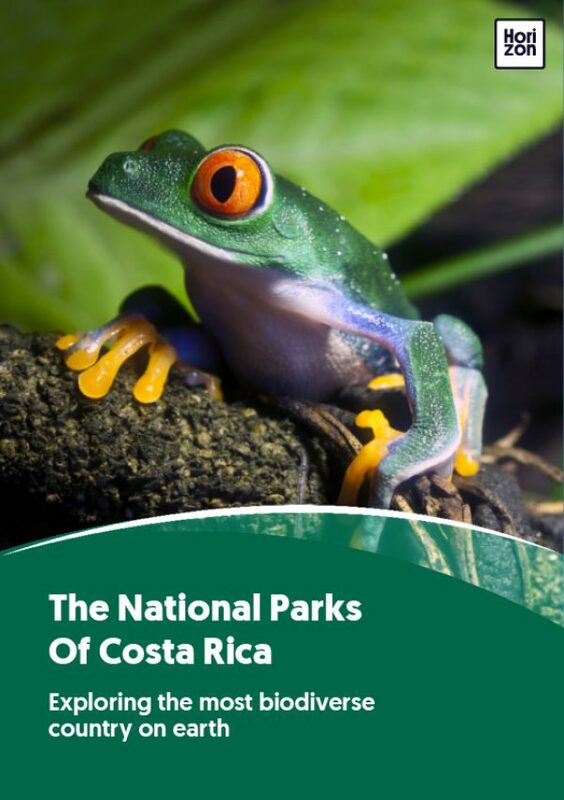 Monteverde Cloud Forest Reserve’s protected area status is “private biological reserve” rather than national park. At 10,193 acres it’s just two-fifths the size of Disney World. The founding Quakers arrived in the 1950s, and the reserve was established in 1972, with the help of visiting scientist George Powell. An initial purchase of 811 acres established the preserve. As a very popular private reserve, Monteverde Cloud Forest Reserve offers a wide range of services: an information center, guided tours, a gift shop, a restaurant, restrooms, potable water, and dormitory lodging. Guided day and night hikes are popular. The park’s 8 miles of hiking trails are comprised of nine trails, or “senderos”. Pantanoso, Camino, Bosque Nuboso, Quebrada Cuecha, and Chomogo are the most popular. El Río, Wilford Guindon, Roble, and Tosi are less trodden. Monteverde bridges the Continental Divide. It is this division that creates the park’s iconic cloud forest, as clouds form on the Caribbean side and blow through the Tilaran Mountain Range and onto the Pacific side of the reserve. The clouds hang beautifully at low levels against the montane forest. Average temperatures range 15-25 C (59-77 F). It’s rainy year-round here, since the reserve is a rainforest, but it’s slightly cooler, windier and less rainy during the “dry” season of December-April. The best time for bird watching (including the spectacular and much-sought resplendent quetzal) is from December-April. Monteverde Cloud Forest Reserve is home to premontane rainforest, low montane rainforest (the vast majority of the park’s acreage), low montane wet forest, and premontane wet forest. The reserve houses 500+ bird species (including resplendent quetzals, bare-necked umbrella birds, three-wattled bellbirds, hummingbirds, black guans, and tanangers), 120 reptile and amphibian species (including glass frogs), and 130 mammals (including 58 bat species, Baird’s tapir, porcupines, white-faced and howler monkeys, and two-toed sloths). A thriving flora consists of 3,000+ plant species, among them 500 species of orchids. An incredible 10% of the flora is endemic, and Monteverde Cloud Forest Reserve is home to a breathtaking 2.5% of the world’s total biodiversity. The reserve is located 91 miles (3.5-4 hours) northwest of San José; and 72 miles (2.5 hours) southeast of Liberia. To get there, fly into either San José or Liberia, and stay in the towns of Santa Elena, Cerro Plano or Monteverde. Travelers to La Fortuna/Arenal often take the shortcut over Lake Arenal, to visit Monteverde Cloud Forest Reserve either on a daytrip or as the next stop on their itinerary. Monteverde’s public entrance is located at the end of a dirt road. Just follow signs from downtown Santa Elena. Entrance cost: $20 adults, $10 students (7:00 a.m. to 1:00 p.m.), $8 students (1:00 p.m. to 4 p.m.), $10 children (ages 6-12). 100% of the entrance fee is funneled into preservation, research, and educational programs.